That is exactly what he has done here: he’s listened to the arguments of precedent on which British constitutional arguments are based, decided that the circumstances are not adequately addressed by precedent, so he’s made a judgement call, in this case one that sets a new precedent. Which is exactly the point: for there to be precedent, someone, somewhen, has made the original decision that creates one. And these are unprecedented times, where the government of the day has been doing its very, very best to ride roughshod over Constitution and convention both. Exactly the point at which these judgements need to be made. Whether that should be the prerogative of an individual or not is another matter entirely, but that is the system we have. That system is one where, in the absence of a written constitution and the body of law that tests and clarifies it, we’ve been winging it for most of the last millennium: someone sets a precedent, someone else goes, “Oh, we hadn’t thought of that, and don’t like it” and then either accepts it or seeks to reverse it with another decision, be that in parliament, in the courts or by trying to adopt “Henry VIII” powers to ignore parliament altogether. And so it goes – that’s both the positive and the negative of the British system: we have a system that is flexible and which can therefore adapt to new circumstances. It does however rely on the participants in that system being, “Good Players” – people who will act within both the conventions and spirit of parliament. That’s something our current ‘government’ has spectacularly and repeatedly failed to do. So extraordinary times such as these call for extraordinary decisions to be made in order to hold power to account. The Speaker has done his job and, in doing so, may be acting – consciously or not – in the finest traditions of previous holders of the post. In the “Good Parliament” of 1376, the seventh Speaker, Sir Peter del la Mare, delivered an address condemning corruption at court, and calling for close scrutiny of the royal accounts, after which Parliament arrested those accused and imposed a new set of Councillors on the King. Of course, John of Gaunt then had him slung into prison, but such is often the lot of those who seek to constrain the abuse of power. Perhaps most pertinently, in 1642, Speaker William Lenthall went head-to-head with Charles I1: when the King, with his armed entourage, entered the chamber with the intent of seizing five ‘disruptive’ members on charges of High Treason (all of whom had already legged it), Lenthall responded to the King’s demand for information on their whereabouts with a circumlocution worthy of Bercow, “May it please your Majesty, I have neither eyes to see nor tongue to speak in this place but as the House is pleased to direct me, whose servant I am here“. At that point Charles dissolved parliament, and we know how well that ended for him. There’s a lesson there for the current regime, if they but heed it. What then we saw today is the somewhat chaotic and ill-defined British constitution in dynamic action, with The Commons doing exactly what it’s supposed to do when a government attempts to arrogate powers to itself that are rightly those of Parliament. Well played. 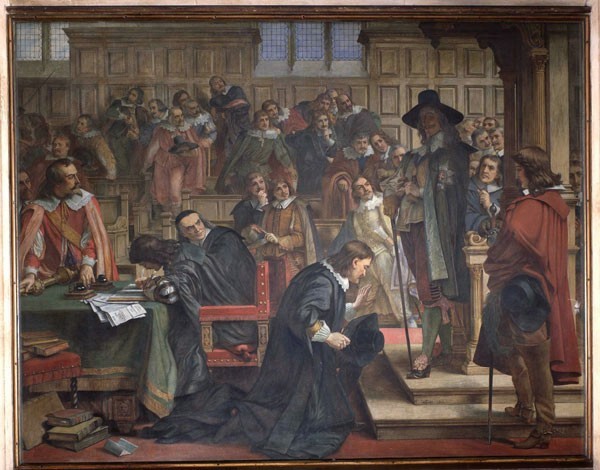 The painting heading this post is Charles West Cope’s 1866 painting of Speaker Lenthall Asserting the Privileges of the Commons Against Charles I when the Attempt was made to Seize the Five Members.